OK, I don't know why it took me until now to figure this out? I am a geek! I am not talking speak Klingon, went to Space Camp geek...but, I love me some J. J. Abrams geek. Bottom line, Husband gave me the afternoon off (best Mother's Day present in my book) so, I saw the new Star Trek Movie. Stoopid Ebert gave it two stars, and called it a cheesy space opera:P Ummm.....dude could not be more wrong. We are talking ball out of the park here! "Space, the final frontier, these are the voyages of the Star Ship Enterprise. It's five year mission: to explore strange new worlds, to seek out new life and new civilizations, to boldly go where no man has gone before." Anyway, this movie ROCKS! I loved the new James T. Kirk. Loved the new Spock. Loved the new Bones. Loved the new Sulu. Loved the new Scotty...Loved. 'em. all. Now then...if you are a LOST fan, this is a must see. Midway through the movie...I leaned over to my Brother and said "I feel like we just crossed over to LOST."... 'cause we had. I don't want to ruin any plots...but time travel, and time lines play a huge role in the new Star Trek. It is very easy to see that J. J. Abram's hand prints are all over both LOST and Star Trek. I now have my head wrapped around LOST more clearly after seeing Star Trek. This movie was top notch. It was funny, campy, shiny, polished...The actors nailed their characters. The script delivered every line you wanted to hear..."Dammit Jim...I'm a Doctor!" "I'm giving it all she's got Captain!" "Live long and Prosper"...it's all there, and more! So yeah...I'm a geek:P Who saw it? Am I alone here??? I, too, love the old Star Trek - Wrath of Khan is my favorite movie! I haven't seen the new one - kind of interested to see what it's like. Lalalala...fingers in ears. I will join you in your geekyness. Soon. Very soon. The family saw "Star Trek" today, and we really liked it! I also loved the connections between it and "Lost." Hard to believe that this week is the "Lost" season finale; I'm going to be sad EVERY Wednesday until the next season starts. I loved it, too, but I fully expected to love it. I watched the original series and I'm hoping to indoctrinate my boys very soon. They already love all things Star Wars and sci-fi. The new characters had just enough of the old to make them endearing and enough of the new to make them fascinating. I can't wait to see what they do for the next movie. I am waiting for my afternoon off to go watch this!! My brother and I were so crazy about Star Trek growing up. Actually, we're both still crazy about it and spend lots of time "discussing" it. Wish I could go watch it with him but he didn't wait! I never could get into it. But I still think you are cool : ) and most importantly I am glad you had a wonderful mothers day doing something you loved! Is Winona Ryder in this movie? That's what I heard... does she play someone's mom? I loved it as well. I never watched the original series, well I've seen enough to know the characters, etc. I was a fan on next generation. Really loved this movie, though Abrams did an amazing job. I loved when the characters delivered the lines, you are right they got them all! 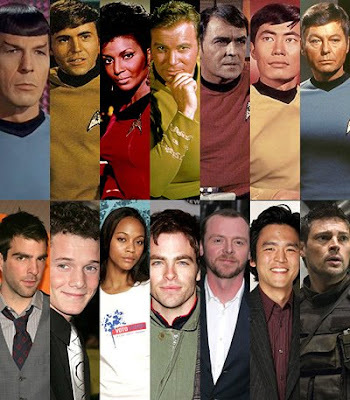 I am a Trekkie (is that how you spell that?) of the Next Generation series. We used to watch it every Sunday night when I still lived at home. I will see this though just because so many people loved it. And yes the afternoon off is a mighty good Mother's Day present. I didn't see it, but I vaguely remember watching Star Trek on tv years and years ago with my brother on Saturday afternoons...or wait, that might have been Planet of the Apes. Obviously, I'm not a trekkie (but I DO like Star Wars!). I want to see it so bad. Hubby and I dressed up like characters from star trek a few years ago (he spock, and I a blonde sidekick)...talk about super geeks LOL! Would you recommend it for a five year old? Not sure of the ratings…thanks for the post…enjoyed it. Brought back so many memories of a wonderful life without cable. HA! I saw it too. Fantastic! I didn't watch the original, but I loved TNG and have seen several of the movies. You're right the actors nailed those main characters. I've been trying to place the kid who played Chekov and can't figure it out. Will have to IMDB him. And Harold as Sulu?!? Brilliant! Better than Kumar on House. (Especially since that ended so badly). Just found your blog via Twitter. Loving it! I wanted to see it SOOOOO badly but didn't have a chance. So obviously I'm a geek too lol. I haven't seen it but I, too, got the afternoon off on mother's day and it was delightful. I've already been to it TWICE!!!! It ROCKS! OK, so it MAY have been a bit soap opera-y, it did make my cry in the first 5 minutes, and most Star Trek's don't do that, but it was AWESOME! The emotions it evokes, crying, fear, TERRROR, excitement, laughter........ just amazing! Best Trek movie EVER!